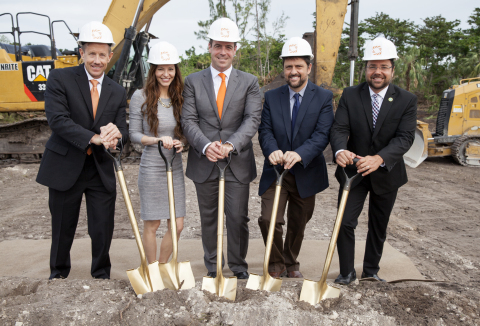 DAVIE, Fla.–(BUSINESS WIRE)–Sintavia, LLC, a leading Tier One metal additive manufacturer, broke ground today on its new 55,000 square foot advanced manufacturing facility located in Hollywood, Florida. The $15 million facility, expected to open in late 2018, is the first facility of its kind to employ Lean manufacturing principles for large-scale metal additive manufacturing. What makes additive manufacturing different from more traditional methods of manufacturing is the addition of material rather than its removal. By using additive processes, businesses benefit from shorter lead times, mass customization, greater complexity, lower cost, less wasted material, and greater energy efficiency. The additive manufacturing industry, estimated currently at $7 billion globally, is expected to more than triple in the next three years. Sintavia is a leading Tier One additive manufacturer for critical industries, including Aerospace & Defense, Oil & Natural Gas, Automotive, and Ground Power Generation. With high-speed printers co-located alongside precision post processing equipment, a full complement of mechanical testing equipment, and a full metallurgical and powder laboratory, Sintavia is able to optimize parameters, serially manufacture, and audit quality parts for critical industries. Sintavia is committed to the highest quality standards in the industry, and holds AS9100, ISO17025, and ANAB accreditation, as well as being OASIS registered and ITAR compliant.